A horror film of a different kind, Nicolas Pesce's extraordinary film debut is a deeply disturbing and chillingly conceived piece of work. 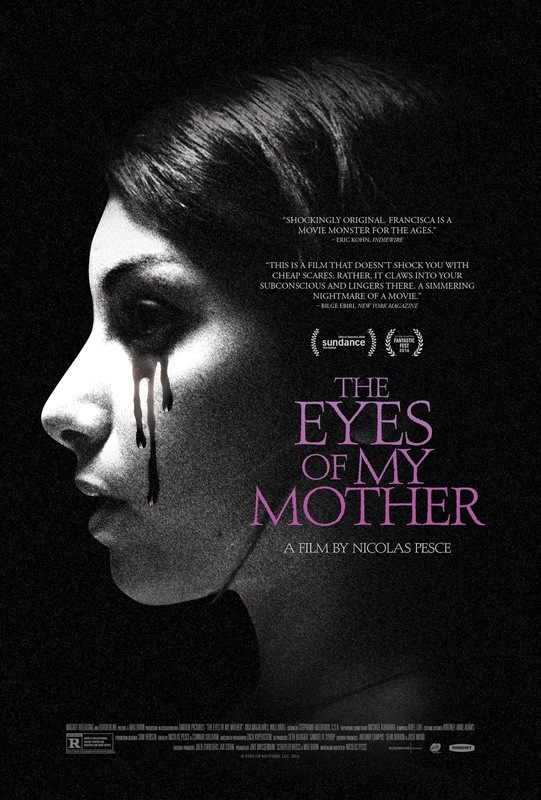 Set on a rural farm in Portugal, The Eyes of My Mother tells the story of a young girl named Francisca, whose mother, a successful surgeon, is murdered before her very eyes. After her father captures the killer and ties him up in their barn, Francesca decides to take care of her new friend, by becoming the surgeon her mother always dreamed she would become. As the years roll on, Francesca's victims mount, as she desperately searches for a real, human connection the only way she knows how - dissection. Shot in eerie, evocative black and white, The Eyes of My Mother feels like a feminist twist on The Texas Chainsaw Massacre, in which the killer discovers that the "final girl" is even more of a monster than he is. There's a certain surreal quality to it all, even if there aren't any overtly surreal elements. Pesce dispenses with filmmaking basics like establishing shots to set-up locations, and cuts away from scenes at moments that feel intuitively wrong, often showing us the aftermath of important actions rather than the actions themselves. A scene from THE EYES OF MY MOTHER, a Magnet release. Pesce intentionally avoids the story's inherent violence, focusing instead on its consequences. He is more enamored with the ordinariness of Francisca's life around the ghastly events that have come to define it. Imagine Psycho without the murders, instead focusing on Norman's life with his mother, where the infamous are almost an afterthought. The result is jarring and somewhat disorienting, yet we never feel as though we are ever in less than capable hands. Pesce's unique choices create a certain dreamlike quality, of interconnecting scenes held together by gossamer strands of logic, veering quickly into a world of nightmares. You'll find no jump scares here, no things that go "bump" in the night. The Eyes of My Mother is a haunting slow-burn of a film, one that eats its way under the skin with sadistic precision. Everything about it just feels off somehow, and Pesce's insistence on showing the prelude and the aftermath of the violence rather than the violence itself gives us the feeling that we're bearing witness to something we're not supposed to see. Each shot is framed like a photograph, a snapshot into the mind of someone who is deeply disturbed, but feels as if their life is completely normal. Yet underneath its otherworldly beauty is something sick and twisted, a shocking examination of madness that is unlike anything we've seen before. THE EYES OF MY MOTHER | Directed by Nicholas Pesce | Stars Kika Magalhaes, Diana Agostini, Paul Nazak, Will Brill | Not Rated | In Portuguese w/English subtitles | Opens Friday, December 2, in select cities.